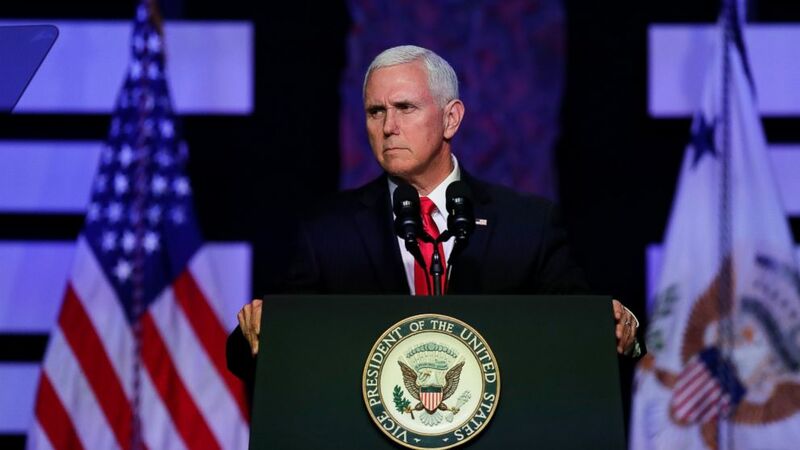 U.S. Vice President Mike Pence told a crowd in Florida on Friday that it is time to take action to end the socialist regime of Venezuelan President Nicolas Maduro. Pence told dozens of Venezuelans that Washington was working toward a "peaceful transition" so opposition leader Juan Guaido rises to power. But he reassured them President Donald Trump's administration would further weaken Maduro. Before his speech, Pence sat down with a college professor who says he and his wife were physically assaulted by armed pro-government groups. In a round-table discussion, he also heard from other Venezuelans refugees such as a former city councilman who says he was accused of being a CIA agent. A doctor showed enlarged pictures of children seemingly dying of hunger. A Venezuelan accountant and professor at Andres Bello Catholic University, Jose Ali Ravanguoy, told Pence and Florida politicians that he was being persecuted for teaching about democracy in working-class neighborhoods that were socialist strongholds. "We started to make noise," he said. About 190,000 Venezuelans live in Florida, and many have arrived in recent years as the country spiraled downward as a result of an economic and political crisis under Maduro and former President Hugo Chavez. Sen. Marco Rubio, a fierce critic of Maduro, warned that time was running out for the socialist leader to voluntarily step down from office. "Nicolas Maduro has got big problems. This is not like the other times. You've made a terrible enemy in Donald Trump," Rubio said. Pence said the Trump administration would continue to put diplomatic and economic pressure to force Maduro to cede power and restore democracy in the South American nation. He repeated a message that Donald Trump has given before regarding consideration a military intervention, and said "all options are on the table." Alejandro Segovia Marquez, a former city councilman who says he was accused of working for the CIA, told Pence in a discussion that Venezuelans can't wait any longer because time equals deaths. "We, the Venezuelans, stand by the United States' side and are waiting for you," he said. "For pity, for humanity, do not drag your feet on this issue."